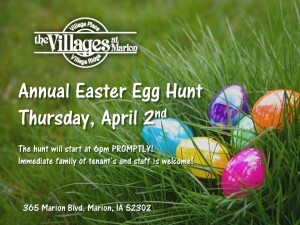 The Villages at Marion is excited to announce that we have set the date for our annual Easter Egg Hunt! This fun event will take place on Thursday, April 2nd and will begin at 6 p.m. sharp! All immediate family members of tenants and staff are welcome. RSVPs are greatly appreciated and can be done so by calling The Villages at 319.377.9808. We can’t wait to see you for all the fun!